PHOENIX – Monica Strauss pulls on a pair of plastic gloves every morning to dig through blue recycling bins set out on curbs in parts of the city. 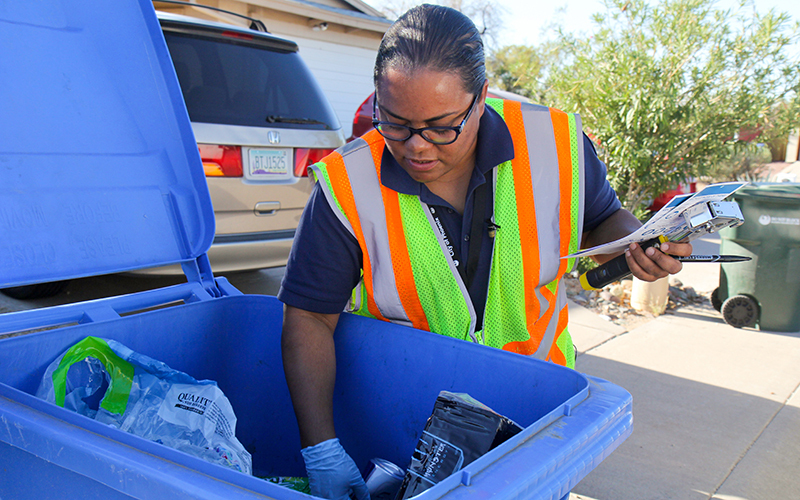 The Phoenix Public Works Department employee is methodical as she approaches each blue bin and sorts through the paper, cardboard boxes, plastic waste and other contents. She jots down some notes and uses her industrial stapler to attach feedback to the bin. She does the same at each container until nearly all the recycling bins in this neighborhood have green or red tags hanging off the lids. The green tags say “Shine on,” the red ones say “Oops” and explain what the homeowner needs to do differently. The efforts are part of a new recycling program that gives residents individualized feedback. Many people are overly ambitious when recycling and throw items in their blue bins that actually belong in the green trash bins. This contamination, if severe enough, can mean an entire truckload of recyclables ends up in the landfill. Phoenix has an average recycling contamination rate of 30 percent, said Jesse Duarte, deputy director of public works for the city. But he said officials hope to drive that down to below 20 percent or less with the new education program. Unclean food containers, lawn clippings, old clothes, wooden items and greasy pizza boxes can’t be recycled, yet people regularly put these items in their recycling bins. Other non-recyclables, such as plastic bags and wrappings, can cause mechanical malfunctions that slow down the sorting process. 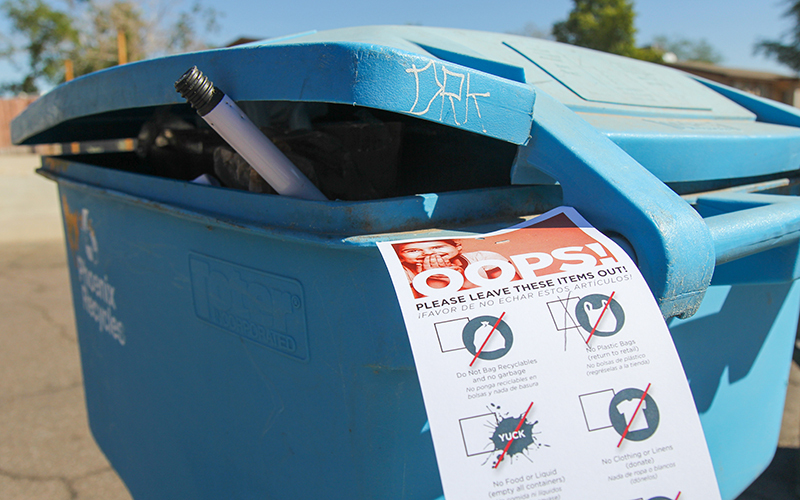 A truck will pick up residents’ recycling that has an “Oops” tag on the bin for two weeks. After that, the city won’t pick up the contaminated recycling, and city employees will roll the bin back up to the house. City employees check a neighborhood’s bins once a week for five weeks. 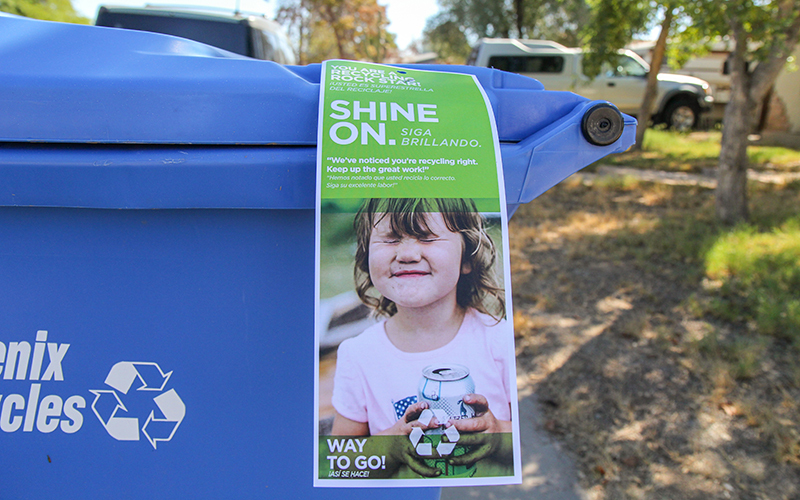 Residents earn a “Shine on” tag when they improve their recycling to contain none or very little contamination. Duarte and Tetreault said the program is time-intensive but effective. “They (residents) may not read their bill or they may not have internet access, but virtually everyone wheels out that barrel to the curb,” Tetreault said. The city launched a pilot program in February with 1,200 households in southeast Phoenix. At first, Duarte said, about 70 percent of residents had recycling contamination and received an “Oops” tag. At the end of the program five weeks later, he said, the results flipped and 70 percent of residents received “Shine on” tags. Last month, Phoenix launched the program in neighborhoods across the city with historically high contamination. The city monitors data from each recycling route to determine which neighborhoods have the highest contamination rates. The city also plans to periodically recheck households included in the pilot program to make sure they don’t fall back into bad habits. Meghan Easter’s north Phoenix neighborhood is now part of the program. She received an “Oops” the first week. “I’m not surprised,” Easter said with a laugh when she saw the tag. She said her kids are in charge of the recycling and often mess it up.